Russian support personnel work to help get crew members out of the Soyuz TMA-01M spacecraft shortly after the capsule landed with Expedition 26 Commander Scott Kelly and Flight Engineers Oleg Skripochka and Alexander Kaleri near the town of Arkalyk, Kazakhstan on Wednesday, March 16, 2011. LONDON - The problems that troubled the first flight of Russia's new digital Soyuz space capsule last year are still unknown with just eight weeks remaining before the spacecraft design's second flight to the International Space Station. The second digital Soyuz, called TMA-02M, is due to launch three new crewmembers toward the space station this summer. The flight is currently slated to launch on May 30, NASA officials have said. The Soyuz TMA-02M flight will continue tests of the Soyuz's new digital control system that began with the launch of the digital design's debut flight (TMA-01M) last October. During that first mission, the Soyuz's digital system suffered a computer display malfunction on it Neptune computer console, which required repairs once the vehicle arrived at the space station. The Soyuz TMA-01M spacecraft returned to Earth in mid-March with a successful landing on the snowy steppes of Kazakhstan in Central Asia. In the first public comments by a senior Russian Federal Space Agency official on the matter, the agency’s deputy head Vitaly Davidov told SPACE.com that now TMA-01M "is back we shall finally find out what was wrong." 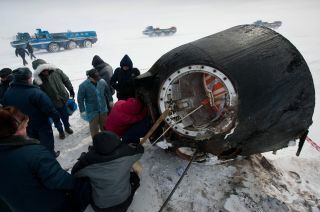 When the Soyuz TMA-01M landed safely, it returned a NASA astronaut and two cosmonauts home after a five-month spaceflight. Davidov said Russia's space agency is taking a close look at the spacecraft's software and hardware to pin down the computer problem from its Oct. 7 launch. The next digital Soyuz is slated to launch in weeks to ferry Russian cosmonaut Sergei Volkov, NASA astronaut Mike Fossum and Japanese astronaut Satoshi Furukawa toward the station. It will lift off on May 30 after the launch today (April 4) of a Soyuz TMA-21 – a non-digital design version of the spacecraft. Volkov has told reporters that he is confident of modifications made to the digital Soyuz design. “We have backup equipment installed onboard our vehicle [TMA-02M], this device that already was checked by the expedition that recently returned from space and we have already installed this equipment,” Volkov said in a March 21 press conference. Volkov was referring to the work done by Russian cosmonaut Alexander Kaleri, who worked on the TMA-01M’s Neptune instrument panels before its return to Earth carrying himself, the station's Expedition 26 commander Scott Kelly of NASA and Russian flight engineer Oleg Skripochka. But Kaleri did not just check the equipment. He also added four microamperemeter assemblies during the systems check up, according to a NASA status update. The Neptune display problems may not be the only potential issues for the digital Soyuz's next flight, as not all of the new systems and capabilities were tested with TMA-01M. "For us it is going to be the middle of the autonomous flight to station when we’ll use almost 100 percent all abilities of new [digital control system] for the docking," Volkov said. "It is going to be really new because previous Soyuz used only partially all these abilities." NASA has also been involved in Russia's digital Soyuz preparations. The space agency has a vested interested since it plans to continue flying astronauts on Russian Soyuz vehicles once its 30-year space shuttle program retires for good this year. The launch was delayed from March 29 to April 4 to due to a problem with the Soyuz's Kvant-V two-way communications system. TMA-21 is an older analog spacecraft, referred to as Series 200. The digital Soyuz models are called Series 700. Eight weeks later, the Soyuz TMA-02M will launch Fossum, Volkov and their fellow expedition 28 flight engineer, Japanese astronaut Satoshi Furukawa. NASA says it will continue to participate in the Russian’s General Design Review for each Soyuz mission, which is their equivalent to the U.S. space agency's Flight Readiness Review process before every shuttle mission.